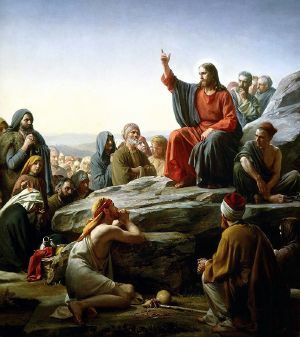 Jesus instructs his disciples in the Sermon on the Mount. In Christianity, the disciples were originally the students of Jesus during his ministry, although the term can also be used to refer to anyone who follows Jesus. The term is sometimes synonymous with the Twelve Apostles, but the gospels actually refer to varying numbers of disciples, including a group of 70. While the active disciples were usually male, the most well-known disciple outside of the Twelve was Mary Magdalene. John the Baptist also had disciples, as did some of the Old Testament prophets such as Isaiah (Is. 8:16). In the Book of Acts, the Apostles themselves have disciples, and at the end of his ministry, Jesus instituted the Great Commission, commanding those present to "go therefore and make disciples of all nations" (Matthew 28:19-20). A disciple today may be a way of self-identification for those who see themselves as followers of Jesus or adherents to Christianity. The term is also used in English as a general term to mean "pupil" or one under the discipline of a teacher. The word is derived from the New Testament Greek word μαθἡτἡς, coming to English by way of the Latin discipulus. It is distinct from apostle, meaning "messenger, he that is sent." While a disciple is one who learns from a teacher, an apostle is sent to deliver those teachings to others. The word Christian appears only one time in Christian scriptures, while disciple appears 232 times in the four gospels and the Book of Acts. The number of major disciples of Jesus is sometimes given as three, and at other times four. Peter, John, and James accompany Jesus to the Mount of Transfiguration. Later, they are posted at the Garden of Gethsemane to keep watch while Jesus prays (Matthew 26:35-37). There, they famously fall asleep three times, allowing Judas and the Temple guards to approach without warning. On the other hand, both the Gospel of Mark (1:16–20) and the Gospel of Matthew (4:18–22) include passages where Jesus initially calls four fishermen from among those at the Sea of Galilee. These are Simon (later called Peter) and his brother Andrew, and the brothers James and John. A very similar account in the Gospel of Luke (5:1–11) lacks a mention of Andrew, placing the number again at three. The Gospel of John (1:35-51) also includes an initial calling of disciples, but those named are Andrew, Simon (Peter), Philip and Nathanael. Here the disciples are hearers of John the Baptist, rather than working as fisherman, when Jesus meets them. Later passages of John's Gospel presents the two most prominent disciples Peter and "the disciple whom Jesus loved," presumably John himself. Simon Peter, James, and John are commonly termed "the Three." Whether to think of "the Four" or "the Three" major disciples is a point which some Christians debate, but is not an essential doctrinal point. However, the issue of Peter's chief discipleship is indeed an issue. In the Eastern churches, Peter is considered the "first among equals," while in the Western church, his authority is greater than that of any other disciple and his later position as supposed Bishop of Rome gives particular importance to that episcopal seat. Jesus washes the feet of his disciples. The Gospel of John also refers to a significant but unnamed disciple called the Disciple whom Jesus loved. Since the Apostle John, unlike the other Twelve, is not otherwise named in John's Gospel, the "beloved disciple" is usually assumed to be he. The number of persons among Jesus' disciples is not always given in the gospel accounts. For example a "large crowd" of his disciples is mentioned in the opening of the passage of the Sermon on the Plain, which begins in Luke 6:17. Additionally, 70 (or 72, depending on which ancient manuscript is used) people are sent out in pairs to prepare the way for Jesus (Luke 10:1). They are sometimes referred to as "the Seventy," the number probably being related to the 70 elders who advised Moses (Exodus 24:1) in the Old Testament and the number of members of Jewish Sanhedrin, or governing council, in the time of Jesus. Their mission included preparing for Jesus' coming in the towns where he planned to go, healing the sick, and spreading the word that God's reign is at hand. They were to take no personal possessions with them, not even a purse or sandals. Jesus declared that whoever "heard" these 70 also heard Jesus as well, and whoever rejected them rejected Jesus as well as rejected God. Likewise, in Matthew's Gospel, Jesus indicated that "If anyone gives even a cup of cold water to one of these little ones because he is my disciple... he will certainly not lose his reward." (Matthew 10) In addition, they are granted great powers over Satan and their names are written in heaven. The disciples are to be absolutely dedicated to Jesus' ministry, not even taking time out to attend their parents' funerals. And while elsewhere Jesus preaches the commandment to honor ones father and mother, in Matthew he tells his disciples that: "I have come to turn a man against his father, a daughter against her mother... a man's enemies will be the members of his own household." (Matthew 10:35) Luke reports that "The seventy-two returned with joy and said, 'Lord, even the demons submit to us in your name.'" (Luke 10:17) Jesus predicts that they will be persecuted and in the future may even lose their lives. However, they are not to worry about what to say, because "it will not be you speaking, but the Spirit of your Father speaking through you" (Matthew 10:20). 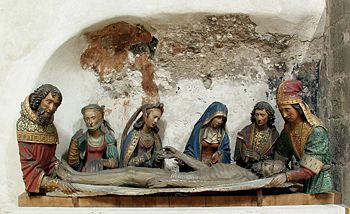 Joseph of Arimathea (right) and Nicodemus (left) with the Virgin Mary, two female disciples, and the Beloved Disciple attending to the body of Jesus. The Twelve and the Seventy were apparently all males (see below for female disciples), and other male disciples are also mentioned. One of particular interest is Joseph of Arimathea. Mark, Matthew, and John name him as a disciple. Luke identifies him as a good man and a member of the Sanhedrin. John specifies that his discipleship was secret. Another probable disciple was Lazarus, the man whom Jesus reportedly raised from the dead. He is called "one you love" by Luke (11:3) and "our friend" in John (11:11). Another member of the Sanhedrin, the Pharisee Nicodemus, though never named as a disciple, places himself in the position of a student of Jesus in John 3:1-10. He later defends Jesus before the Sanhedrin (John 7:50) and finally accompanies Joseph of Arimathea to retrieve Jesus' body after his death, providing about 75 pounds of costly myrrh and aloes for Jesus' burial (John 19:39). After the Resurrection, Cleopas is named one of the two disciples to whom the Resurrection appearances of the risen Jesus appeared on the road to Emmaus (Luke 24:18). In the Book of Acts, Matthias is elected to replace Judas Iscariot as one of the Twelve, and James the Just, also called "the Lord's brother" becomes the apparent head of the Jerusalem church. At the cross, Jesus was attended by only a few of his female disciples, his mother, and—according to John's Gospel—the Beloved Disciple. In Luke (10:38–42), Mary, sister of Lazarus and her sister Martha both appear to be disciples of a sort. While Martha serves, Mary had chosen "the better part," that of listening to the master's discourse. John names her as the "one who had anointed the Lord with perfumed oil and dried his feet with her hair" (11:2). 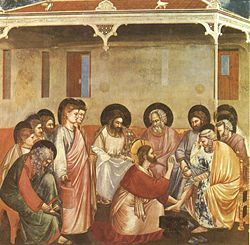 However, in Luke, an unidentified "sinner" in the house of a Pharisee named Simon anoints Jesus' feet. In some traditions, Mary, the sister of Lazarus, is seen as the same as Mary Magdalene, as well as being the sinful woman at the house of Simon the Pharisee. Others see these women as two, or even three, separate persons. Luke names a number of women as supporting Jesus and his disciples financially. He names three: "Mary, called Magdalene, ...Joanna the wife of Herod's steward Chuza, and Susanna, and many others, who provided for them out of their resources" (Luke 8:2-3). Mary Magdalene and Joanna are among the women who went to prepare Jesus' body in Luke's account of the resurrection, and who later told the apostles and other disciples about the empty tomb and the words of the "two men in dazzling clothes." Mary Magdalene is the most well-known of the disciples outside of the Twelve. More is written in the gospels about her than the other female followers. There is also a large body of lore and literature covering her. At the time of his crucifixion, Jesus was reportedly abandoned by all of his male disciples, with the exception that John's Gospel reports that the Beloved Disciple was present. The gospel writers differ as to which women witnessed the crucifixion and were witness to the resurrection. Mark includes Mary, the mother of James and Salome (not to be confused with Salome the daughter of Herodias), at the crucifixion, and Salome again at the tomb. 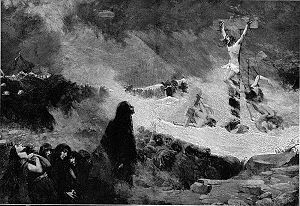 John includes Mary the wife of Clopas at the crucifixion. Perhaps the most widely used guide for who is a true disciple is Jesus' self-referential example from the Gospel of John 13:34-35: "I give you a new commandment, that you love one another. Just as I have loved you, you also should love one another. By this everyone will know that you are my disciples, if you have love for one another" (NRSV). Luke 14:26—"Whoever comes to me and does not hate father and mother, wife and children, brothers and sisters, yes, and even life itself, cannot be my disciple." Luke 14:27—"Whoever does not carry the cross and follow me cannot be my disciple." Luke 14:33—"So therefore, none of you can become my disciple if you do not give up all your possessions." These standards, obviously, could not remain as long-term qualifications in a stable Christian society. Rather, they evolved to become standards for true saints or martyrs, while discipleship took on a more practical meaning. Generally in Christian theology, discipleship is a term used to refer to a Christian's transformation from some other worldview and practice of life into that of Jesus Christ, and so, by way of later Trinitarian theology, of God himself. The Apostle Paul described this process as being: "not be conformed to this world, but be transformed by the renewing of your minds, so that you may discern what is the will of God—what is good and acceptable and perfect" (Romans 12:2). Therefore, a disciple is not simply an accumulator of information or one who merely changes moral behavior in regards to the teachings of Jesus, but seeks a fundamental shift toward the ethics of Jesus Christ in every way, including complete devotion to God. In several Christian traditions, the process of becoming a disciple is called the Imitation of Christ, after the famous book of that title by Thomas à Kempis. 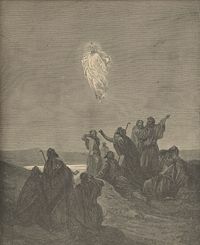 Witnessing Jesus' ascension, the faith of the disciples is rekindled. Ubiquitous throughout Christianity is the practice of making new disciples. At the beginning of Jesus' ministry, when calling his earliest disciples, he reportedly said to them, "Follow me and I will make you fish for people" (Matthew 4:19). Then, at the very end of his ministry Jesus instituted the Great Commission, commanding all present to "go therefore and make disciples of all nations, baptizing them in the name of the Father and of the Son and of the Holy Spirit, and teaching them to obey everything that I have commanded you." (Matthew 28:19-20a) Matthew thus presented Jesus as incorporating this practice into the very definition of being a disciple and experiencing discipleship. The same process of transformation is also evident in the recorded experiences of the original disciples of Jesus. Though regarded highly throughout church history, the biblical texts themselves do not attempt to show the Twelve as faultless or even having a solid grasp of Jesus' own ministry, including a recognition of their part in it. All four gospel texts convey, to varying degrees, the confusion and foibles of the Twelve in their attempt to internalize and live out the ministry of Jesus within their own discipleship. On the other hand, according to the Book of Acts, at Pentecost with the coming of the Holy Spirit, the disciples take on a new boldness and determination, often risking their lives to preach the gospel. It is from this point where we see the often confused band of disciples (not limited to the Twelve) mature into what is known as the Church (ekklesia εκκλησια), the forefathers and foremothers of the faith of all modern Christians worldwide. Catholic Encyclopedia: Disciple – www.newadvent.org. What were the names of the apostles? – www.skepticsannotatedbible.com. This page was last modified on 21 October 2017, at 21:41.